Warm and rustic, this piece offers versatile storage and display space. The piece features ten open compartments that can be used for whatever you need, whether you want to show off your books in the living room, or need extra storage for your dining area. 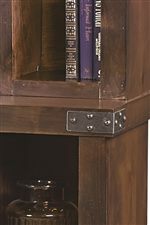 Crafted from alder solids and knotty alder veneers, the bookcase exudes rustic warmth, accented by metal brackets for a unique industrial look. The Industrial Display Case with 10 Shelves by Aspenhome at Walker's Furniture in the Spokane, Kennewick, Tri-Cities, Wenatchee, Coeur D’Alene, Yakima, Walla Walla, Umatilla, Moses Lake area. Product availability may vary. Contact us for the most current availability on this product. 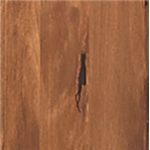 Crafted of knotty alder veneers and solids with metal accents, the Industrial collection is everything its name suggests, with a few modern touches. 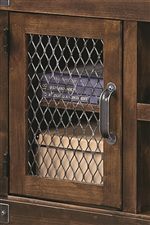 Metal accents like casters, brackets, and wire door fronts have an aged look that brings an authentic vintage feel to the occasional and entertainment pieces. 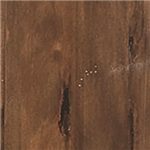 Each piece is available in three finishes; a warm Fruitwood finish, a darker Tobacco finish, or a light Grey finish, all of which exude rustic character. Complete with smart touches like adjustable shelving and cord access holes, the Industrial collection offers modern storage with one-of-a-kind style pieces that put a masculine spin on your favorite flea market finds. The Industrial collection is a great option if you are looking for Industrial furniture in the Spokane, Kennewick, Tri-Cities, Wenatchee, Coeur D’Alene, Yakima, Walla Walla, Umatilla, Moses Lake area. 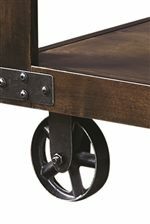 Browse other items in the Industrial collection from Walker's Furniture in the Spokane, Kennewick, Tri-Cities, Wenatchee, Coeur D’Alene, Yakima, Walla Walla, Umatilla, Moses Lake area.